My friend Dmitry has wonderful taste in music. When he told me he had an extra ticket to see the Toronto Symphony Orchestra, I wasn't surprised to find out he actually has a yearly subscription. without sounding like an advertisement, tickets are actually really cheap for people under 35. We had a wonderful time, listening to some more modern pieces before the big number. It was a really lovely thing to sit back and let the music envelop us. Not to mention, the acoustics are amazing in Roy Thomson Hall. 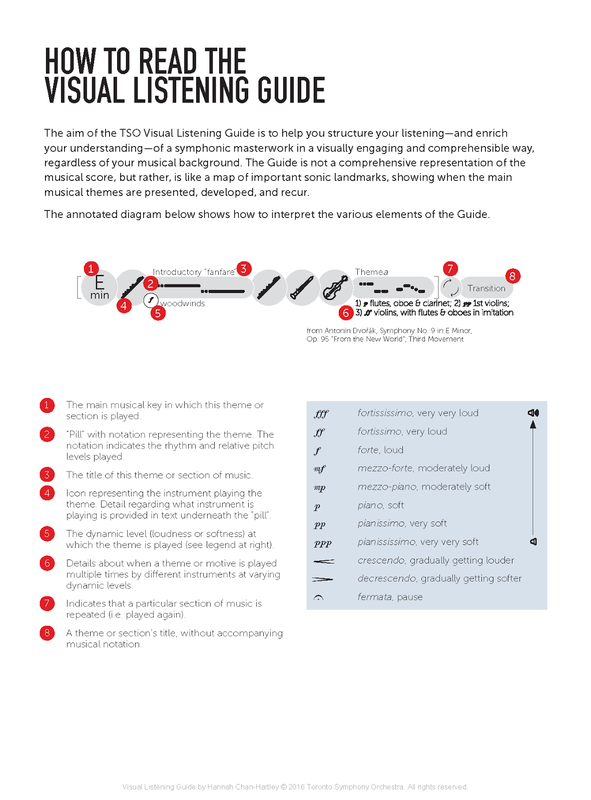 Knowing how to read music (albeit not very quickly), I was able to follow along quite easily with this simplified infographic piece. Not only did it perform its job well, it was also a lovely thing to look at. The icons are simple yet charming, the colours work harmoniously and almost reminiscently of the way the instruments make their harmony, and the flecks to mark the main melodies were easy to identify. This is truly a marriage of form and function. 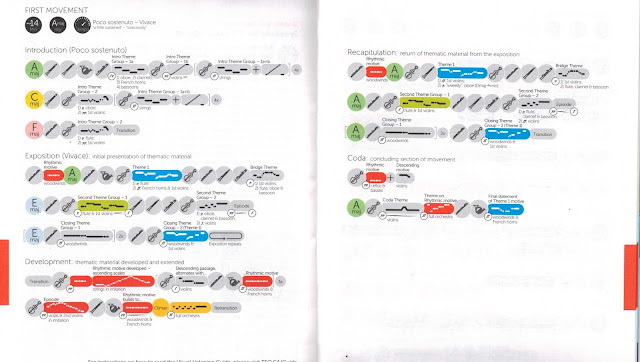 Upon looking into the program, I found that this wonderful thing was created by Hannah Chan-Hartley, the Managing Editor and Musicologist at the Toronto Symphony Orchestra along with designer Gareth Fowler. I am so fixated not only on the lovely visuals and clear iconography, but my experience and how it was immensely heightened by the piece. Really great job, Hannah & Gareth! I found a resource online to decode it after the show; which is to say that you don't really need it. And that's a good thing because the user experience of having to use the internet in order to decode a paper program provided by the establishment is a bit ludicrous, especially when you imagine the demographic of an audience who might use such a feature. I feel like this one small piece of design (only a couple of pages in a medium-thick program) really shaped my experience of the performance in a poignant way, and allowed me to connect even more with the music. I do wonder though, if someone who didn't have a strong understanding of musical notation would be able to follow along as easily. 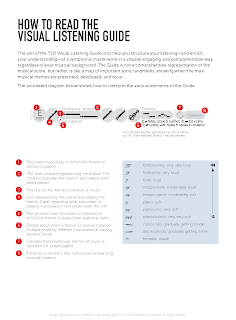 I love the idea of visualizing music to accompany and truly appreciate the genius of composers. Exactly how they can manage every instrument in the orchestra to create one solidified and beautiful sound is beyond me. My favourite part of Beethoven's Symphony No.7 and perhaps the most recognizable is the second movement, which you can view below. The creator of this video displays another way to represent music through visuals, this time incorporation time into the piece. Very cool.